Located along the banks of the Milwaukee River and just minutes from the heart of downtown, the Holiday Inn Milwaukee Riverfront is the latest addition to the Greater Milwaukee scene. Enjoy a luxury selection of spacious guestrooms including deluxe rooms featuring impressive river views. From plush pillow-top mattresses and luxurious linens to premium bath products, our hotel offers a modern twist to a relaxing and peaceful stay. Whether traveling on business or just for leisure, our hotel's modern accommodations and amenities will exceed your every expectation. When staying with us take advantage of complimentary Internet access, complimentary parking, and an extravagant dining experience. Explore all of Milwaukee's rich history and settle in at our hotel after a day on the town. With a variety of local businesses, corporations, shopping and nightlife, theres plenty to do when visiting the Milwaukee/Glendale area. The hotel has been designed to not only give guests easy access to the city's entertainment, but also to provide a serene environment with unparalleled hospitality. Anchorage Restaurant: Onsite offerings include The Anchorage: American cuisine with an emphasis on local seafood in a more formal setting. The River's Edge Lounge: our bar and grill which offers a more relaxed sports bar feel. Riverfront patio and firepit compliment each. Estabrook Grand Ballroom: Whether you need accommodations for a meeting or banquet, you will find everything you need at the Holiday Inn Milwaukee Riverfront Hotel. Our business-savvy hotel staff is skilled at planning and organizing so you can host a stress-free meeting or event. Milwaukee Boardroom: Milwaukee Boardroom is situated on our top floor among beautiful views of the Milwaukee River. The room is set up in a boardroom style with a 70" HDTV Monitor on one side, and full white-board featured wall on the other. Also wet bar and full bath. 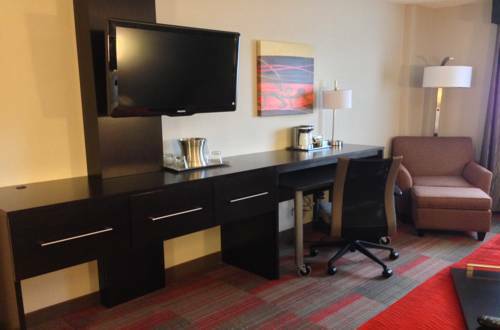 Shorewood Room: Newly renovated, the Shorewood room includes complimentary wi-fi and parking. Bayshore Town CenterThe Bayshore Town Center is located within a mile of the hotel. The town center has numerous midscale to upscale restaurants and shops. It is the premiere shopping center in the Northshore area. Lincoln Golf CourseLincoln Park Golf Course was originally designed as a 6 hole course founded in 1916. In 1922 the course was redesigned as a 9 hole course and in teh early 1960s . Located in a wooded 312 acre park on the Milwaukee River.